After bringing its latest flagship killer to the U.S., OnePlus now introduces a new color option for the OnePlus 6T – Thunder Purple. Up until today, customers in the United States could only buy the OnePlus 6 in Mirror Black and Midnight Black, so the addition of a third option is more than welcome. 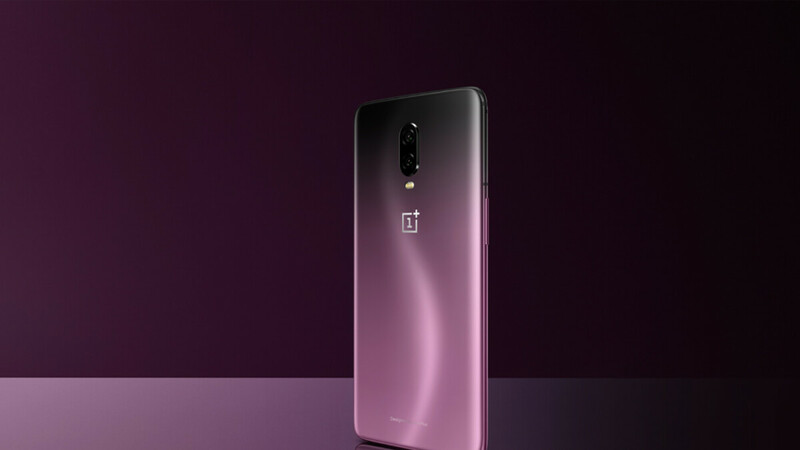 Just like the other two variants, the OnePlus 6T in Thunder Purple costs $580 and includes 8GB RAM and 128GB storage. T-Mobile, the only carrier in the US that offers the OnePlus 6T, will not be selling the Thunder Purple version, but customers can pick it up from the OnePlus online store. The new gradient color looks awesome, so it won't be a surprise if the stock will only last for a few days. The Thunder Purple version of the OnePlus 6T is likely to be available for a limited time, so you might want to hurry if you were waiting for this specific color option. Never understood why some companies limit them selves to 2 standard colours. People out there literally are buying phones that have cool new colours. Even Apple realised that with their XR model. That looks amazing. I only wish it was carrier unlocked for ALL carriers. Such a beautiful color! This is one good looking smartphone. I may actually pick one up in the near future to see how it is. Such a shame that CDMA uses can’t experience this handset, but I do understand that GSM is the dominant network around the world, and CDMA is outdated technology with its left foot and 3 toes from its right foot in the grave already, lol. Definitely looks like a great color. I'm impressed with what the 6T is bringing to the table, but the shocker is that it only starts at $559 iirc. That's flagship specs for less than $600 which makes a recently released midranger a very hard buy. It's not about CDMA or anything despite what some people think. It's about CARRIER SUPPORT. Definitely a great looking color, and the price is right, too. And with less issues than a certain recently released Android flagship that launched with issue right out the gate. It’s great that it’s SUPPORTED by GSM carriers the world over, as CDMA is a dying technology that even the current CARRIERS that use it are quickly getting rid of. The best thing about the 6T is that it isn't a derivative of other devices released like another OEM and it's not being saddled with a convuluted naming structure nor did it wait too long to get it out the door. It's not about CDMA since Verizon no longer uses CDMA nor will they activate any device with CDMA(3G). It's about CARRIER SUPPORT e.g. having the proper carrier bands so the device can be fully used on that particular network. That's why the 7 Plus wasn't practical to use since it didn't have all the proper carrier bands to be used in the US. The neat thing about the OnePlus 6T is that it isn’t a minor upgrade from the previous one that has brought a plethora of issues with it out of the gate. What’s also good about them is that they have proven that they can sell many units with little to no presence in the U.S. like HMD, Huawei and Xiamoi. I’m glad that they are using the more future proof technology of GSM, but it’s a bummer that carriers like Sprint and Verizon are still using CDMA networks, despite what some misinformed people have said. They have the full SUPPORT of GSM CARRIERS, which outnumber those that use CDMA, and it’s a good thing that Verizon and Sprint are hastily dumping the antiquated technology that CDMA is. Although, there are instances of smartphones that are supported by GSM carriers, that still can’t connect to a certain GSM network, despite being supported.